It was certainly feasible to convert our loft into a bedroom, luckily our existing roof has a very steep pitch meaning the internal headroom was more than enough. The internal layout of the house meant that we could remove an airing cupboard to make way for the stairs without having to sacrifice any space in the existing bedrooms. This also meant that the new stairs would be above the existing stairs, making the conversion appear to be part of the original build. The main activity for us was to clear the loft of all the junk that had built up over the years. Other things to consider are clearing a space for any materials to be stored, things like plasterboard will need to be stored somewhere dry. Our materials were stored in the back garden, timber is ok to be left uncovered but should be kept raised off the ground, we placed ours on pieces of old packing timber. Materials that ideally should be kept dry such as plasterboard and flooring sheets were kept covered with plastic sheets. If you have a garage then consider clearing some space for material storage. If possible avoid keeping materials on driveways and front gardens as there is always the risk that things will disappear in the night! You will also most likely need a skip, we put ours off road on the driveway, if you have to put one on the road then you will need a permit from the council. If you are using a professional builder then they will arrange all of this for you. 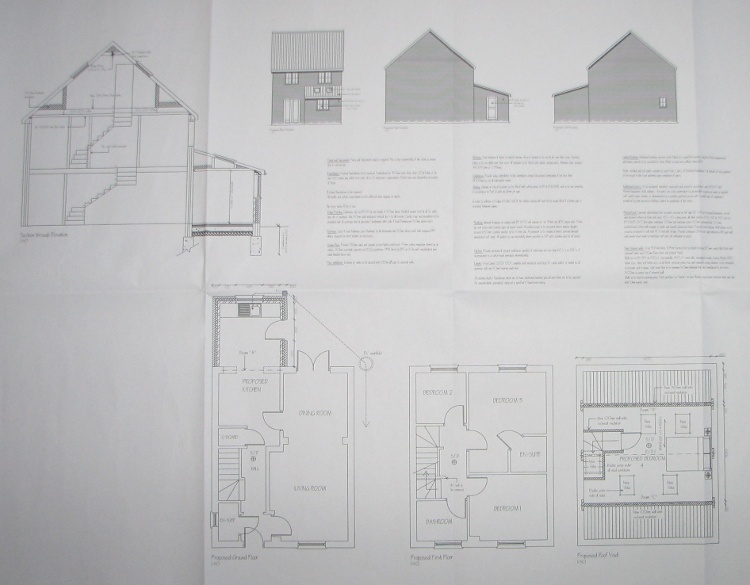 Our builder arranged for the plans to be drawn and for a structural engineer to complete the calculations. You will need a qualified structural engineer to complete the calculations, you can complete the drawings yourself but in the long run it will most likely be cheaper, easier and faster to get someone experienced to complete them for you. Note that if your drawings do not contain all the details that the local council need then there will be lots of wasted time with queries being raised. Most builders will have a structural engineer and architect that they work with on a regular basis. We didn't require planning permission as our conversion falls within permitted development. However, we did submit our plans to the local council before starting work to ensure they were happy with the proposed works. After reviewing the plans the council asked for a few points to be clarified, these were just minor points and our builder spoke with the building control officer directly to clarify the points. This was quite reassuring, its good to know that even minor details are being checked. As our house is detached we did not have to complete a party wall agreement. On the subject of planning permission we have written a guide to building controls, but you should always check with your local councils planning department as they will have the final say.